Cabinteely Athletic Club is nearly as old as Kilbogget Park. It's much loved 400 metre track was laid out in the 1970's and our present day high-jump coach, local Sheila Blake, used to train here. Our sport loving founders were made up of Pat Finnerty, Belinda Teehan, John O'Driscoll, Declan Egan all running enthusiasts, along with coach Kevin Barry, re-established Cabinteely Athletic Club in March 2010 following a lapse in the membership sometime in the mid 1980's. 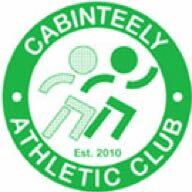 Within months of 2010, Cabinteely Athletic Club was noted as one of the fastest growing athletic clubs with attendance ballooning from 30 to 90 trackside routinely. When young Anna Grennan joined, her Mum Ann Grennan quickly put the proverbial spikes into our Club and helped hugely in the organisation of Cabinteely Athletic Club, and along with Kevin Barry, Brian Doody, Gerard Scully are the driving force of the Club today and our athletes continue to go from strength to strength at Dublin and National competitions. Whilst fun is at the forefront of our training sessions, we aim to help your children find their limits, and exceed them. We strongly encourage all our athletes to take part in the competitions and help build up the points/medals and records for the Club! We compete at all the major track, field and cross country events and they are great days out to mix and mingle with other members in the club whilst cheering "Cabo" on! Today there are over 15 volunteers with in our Club, some who coaching, some who exclusively help in administration. As our membership numbers are fast approaching 250, we seek your help and support in all areas to help build on and develop our great club. Every little bit helps!